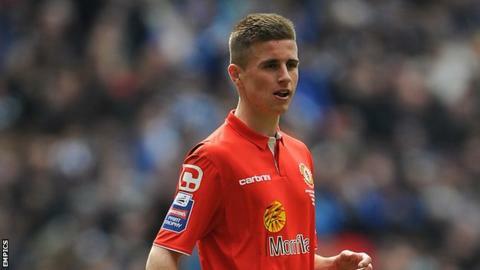 Ryan Colclough scored an injury-time winner as Crewe beat Sheffield United for the first time at Bramall Lane. The visitors went ahead on 12 minutes when Uche Ikpeazu showed great strength to put through Lauri Dalla Valle. Jamie Murphy found Jason Holt inside the box who drilled home his second goal in as many games to equalise for the Blades early in the second half. But Colclough's right-footed strike from outside the box found its way into the roof of the net. Crewe, who had only won one of their previous eight games, move out of the League One relegation zone. Sheffield United's defeat was their first in five games but they remain in fifth place in the table. "We were good in parts but not enough to win the game. To lose after 90 minutes is really disappointing. "Our general decision making going forward was poor and we've got to do better. "I thought we were okay in the second half - we were camped in their half but we just couldn't break them down." Match ends, Sheffield United 1, Crewe Alexandra 2. Second Half ends, Sheffield United 1, Crewe Alexandra 2. Attempt missed. Paul Coutts (Sheffield United) right footed shot from the centre of the box is too high. Goal! Sheffield United 1, Crewe Alexandra 2. Ryan Colclough (Crewe Alexandra) right footed shot from outside the box to the top right corner. Corner, Crewe Alexandra. Conceded by Jason Holt. Attempt blocked. Ryan Colclough (Crewe Alexandra) right footed shot from outside the box is blocked. Ben Davies (Sheffield United) is shown the yellow card. Substitution, Crewe Alexandra. Bradden Inman replaces Nicky Ajose. Corner, Sheffield United. Conceded by Greg Leigh. Attempt saved. Lauri Dalla Valle (Crewe Alexandra) right footed shot from outside the box is saved in the top right corner. Attempt missed. Jamie Murphy (Sheffield United) right footed shot from the left side of the box misses to the right. Chris Basham (Sheffield United) hits the right post with a header from the centre of the box. Substitution, Crewe Alexandra. Anthony Stewart replaces Chris Atkinson. Substitution, Sheffield United. Matt Done replaces Steve Davies. Attempt saved. Steve Davies (Sheffield United) right footed shot from outside the box is saved in the centre of the goal. Substitution, Crewe Alexandra. Ryan Colclough replaces Uche Ikpeazu. Greg Leigh (Crewe Alexandra) wins a free kick in the attacking half. Attempt saved. Harry Davis (Crewe Alexandra) right footed shot from outside the box is saved in the bottom right corner. Chris Atkinson (Crewe Alexandra) is shown the yellow card. Foul by Chris Atkinson (Crewe Alexandra).